This was the gift set that I shared last Saturday for the release. I used the goodies included in the Punchy Potion Bundle. I'm going to share directions on how to make the potion bottle box. You'll need a piece of card stock measuring 5" x 11", two pieces of patterned paper measuring 3 1/4" x 3", two pieces of patterned paper measuring 1 1/2" x 3", a piece of c.s. 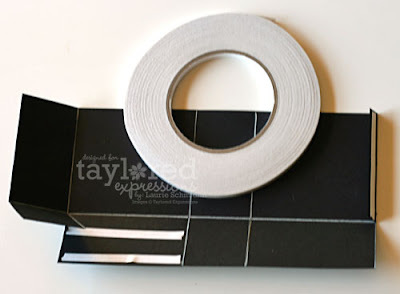 cut out with a shaped die, a piece of patterned paper cut out using that same die (or a smaller version of the die), a decorative brad, & some 1/4" Sticky Tape. *Note: I used a Sizzix die for this box and just trimmed the patterned paper piece a bit smaller than the black one, but any of the Nestabilities Label dies would work wonderfully (with no need for trimming :-)! Using a bone folder (or something similar) crease each score line well. Then, holding your card stock horizontally (as pictured above) make vertical cuts along each score line on the bottom section (see photo above). The 1/2" little flap on the right side is not needed and I just cut mine off. Next, apply sticky tape to the 1/2" flap on the right side and one of the bottom flaps as pictured above. After assembling your box, add the patterned paper pieces, die cuts to the top, and decorative brad. 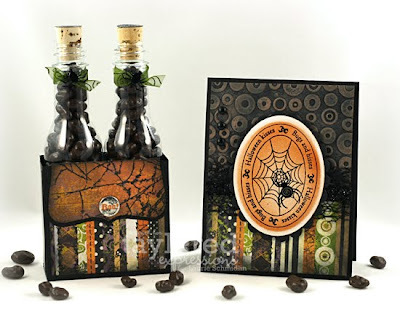 I used items from the Halloween Key Ingredients kit (Basic Grey Eerie patterned paper and Halloween brad)! For added "spookiness", I ink distressed all of my patterned paper pieces using some dark gray ink. Don't forget to check out all of the FANTASTIC Birthday Bash Challenges still going on (scroll down to see them all)!! Each of the Baker's Dozen DT girls have hostessed a challenge and there are FAB*U*LOUS prizes being give away!! Awesome!!!!! Love those bottles! & now a cute little box to put them in!!! LOVE IT!!!! LOVE this Laurie! Simply FAB project and I LOVE the tutorial! I am totally going to make one of these!!! Beautiful! I love that little box - so perfect for gifting! This is just too stinkin' cute! Thanx so much for sharing and the tutorial. I had ordered the set and the bottles and was so happy to see this! I cannot wait to play with this set. You really did an incredible job with these! Wow, That is adorable. Where the heck can you get the bottles?